Wondering what to do with extra zucchini? 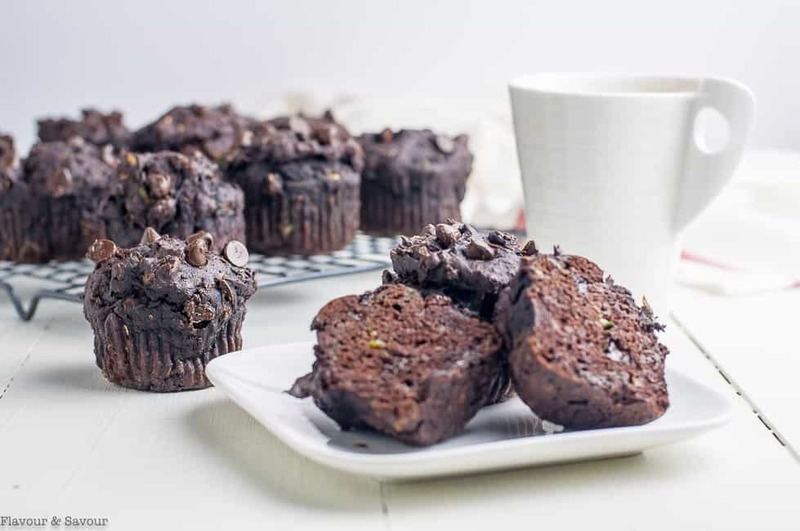 Full of chocolate flavour and studded with chocolate chips, these Gluten-Free Double Chocolate Zucchini Muffins are a great way to use summer squash! Zucchini season is upon us in full force. 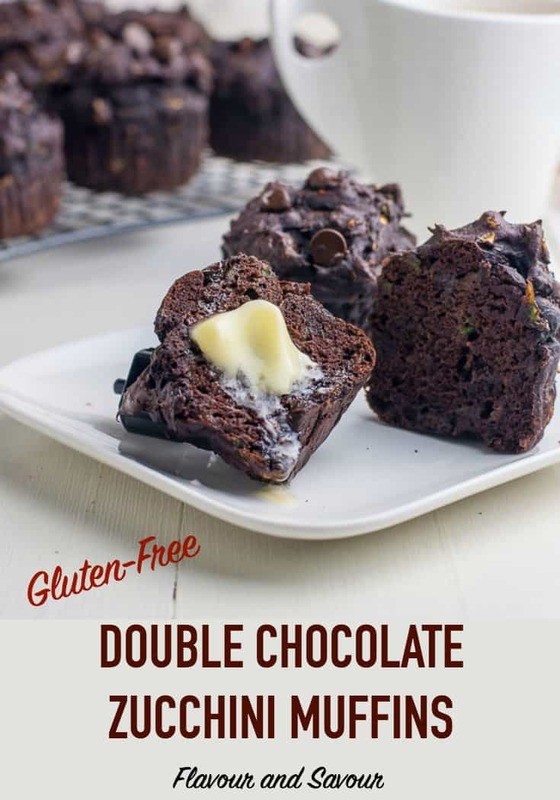 What better way to enjoy it than with a Gluten-Free Double Chocolate Zucchini Muffin? Or two! I love the texture zucchini gives baked goods. While it keeps them moist and tender, it doesn’t impart any strong zucchini flavour. It simply, and very kindly, contributes all its nutritious benefits to a lowly muffin! 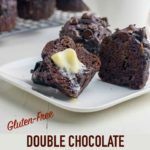 I used Bob’s Red Mill Gluten-Free 1-to-1 Baking Flour in this recipe. I’ve tried many gluten-free flour blends in the last few years, but I have had the most success with this one. It contains xanthan gum, so you don’t need to add it yourself. I lowered the sugar content a little by using a using half coconut sugar (with a lower glycemic index) and half granulated sugar. Adding a little Greek yogurt to the batter along with baking soda helps the muffins to rise and improves the texture. Throughly drain the grated zucchini by squeezing it in cheesecloth or a clean tea towel to prevent the muffins from being soggy. Stir the chocolate chips into the batter, but save a few to press into the top of the muffins before baking. 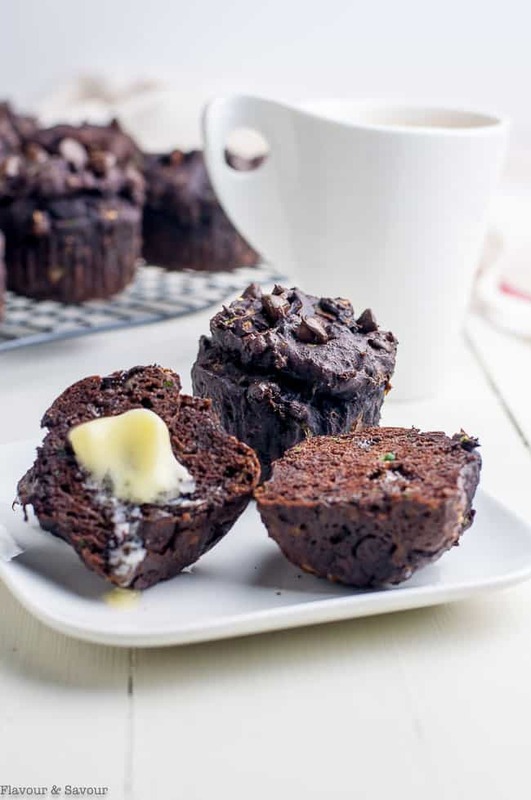 These Gluten-Free Double Chocolate Zucchini Muffins are easy to bake. Follow a standard muffin method for success every time. Whisk the dry ingredients, mix the wet ingredients, add the shredded, drained zucchini and yogurt and stir until just combined. 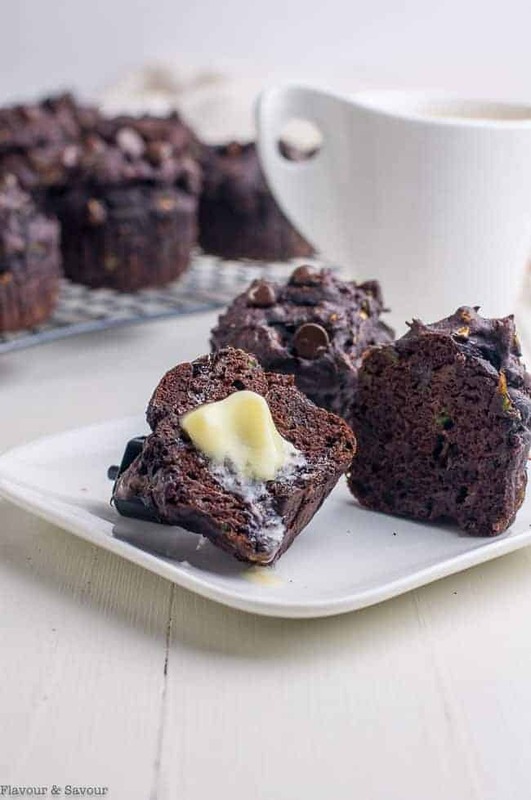 Gently fold in the chocolate chips, saving a few to press into the top of each muffin. Bake, cool slightly and add a slather of butter, if you like! 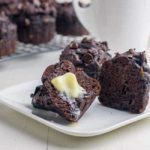 Full of chocolate flavour and studded with chocolate chips, these Gluten-Free Double Chocolate Zucchini Muffins are a great way to use up extra zucchini squash! 3/4 cup chocolate chips* save some to press into muffin tops before baking. Preheat oven to 350°F. Line two 12-cup muffin tins with culinary paper liners. Whisk gluten-free flour, xanthan gum (if using), salt, baking soda and cocoa in a medium bowl. Mix oil, both sugars, eggs, and vanilla in a large bowl or in the bowl or in the bowl of a stand mixer. Beat until fluffy. Gently stir in yogurt and grated and drained zucchini. Stir dry ingredients into batter just until combined. Fold in chocolate chips, saving some to press into the tops of the muffins before baking. Fill muffin cups 3/4 full. Bake at 350°F for 18 - 20 minutes or until toothpick inserted comes out clean. Cool 10 minutes, then transfer to wire rack and remove paper liners. Remove some of the excess moisture from the zucchini by squeezing it in cheesecloth or clean tea towel before adding to batter. SAVE THIS TO ONE OF YOUR PINTEREST BOARDS and connect with me on Pinterest! I’m always finding new tasty recipes to pin. Subscribe to my weekly newsletter and never miss a recipe! My son loves these muffins! I think it’s a great way to add some vegetables into a sweet treat. He likes all those chocolate chips on top, too! We love these too! Lots of chocolate, but healthy zucchini too! Thanks for letting me know!